When life gives you lemons, make lemonade. 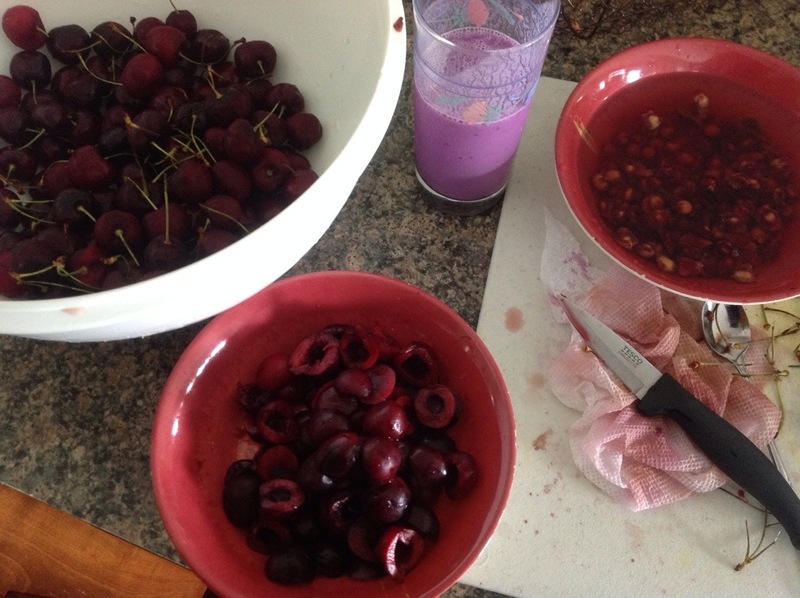 When suddenly gifted with a few pounds of cherries make….. cherry pie, fruit salad, smoothies, cherry juice, popciles……. you name it. I was recently gifted some fresh cherries. What a treat! Living down in the Deep South cherries are not a local produce. They are mostly a product of Washington state. That is about as far away as you can get from Alabama in the continental US of A. Needly to say cherries are a high priced luxury fruit. I did not want one drop to go to waste. I halved the fruit and pulled out the pits over a pan of water. I then froze the halves on a cookie sheet flat in the freezer. Once frozen the cherries can be sealed in a freezer bag. Then we can use them for fruit salads and smoothies. The pits still have a lot of fruit hanging on to them so I will boil them for the juice then freeze in ice cube trays. Those cubes can be added to drinks and smoothies for sweetness and flavor. UK friends do cherries grow locally in the summer or are they imported? How do you preserve cherries and other fruit?